Inspiration and creativity are related to all the art forms around the world. Especially, when an artist meets an artist, a fantastic art piece is created. When Ballet dancer dances on the stage, we know that it’s quite hard for all amateurish photographers to catch up her movement. Even professional photographers, they sometimes face that problem as well. But what if Ballet dancers post their artistic line outside theaters, and let photographers take their pictures? This is a great idea from a visionary team in New York called “Ballerina Project”. They invite experienced photographers to create a combination of dance, fashion, and the city’s landscape through the movement of ballerinas. Visit their blog or become a fan on their facebook to discover more incredible creative photographs both in colors, and many in black and white! If you’re not a Ballet dancer, or not old enough to wear pointe shoes, you might be surprised when a scene of ‘Black Swan’ revealing one of the top ballet secrets! Wearing pointe shoes is a dream of young ballerinas. 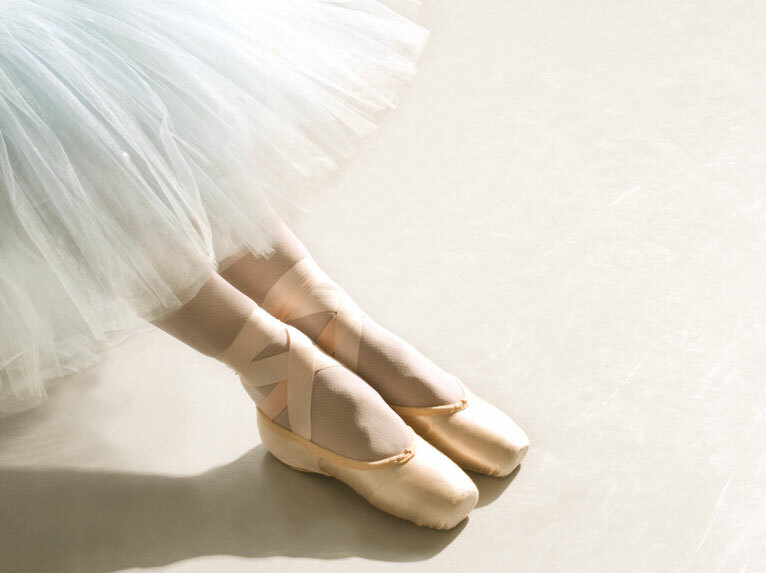 Because of its gorgeous feature, pointe shoes is a symbol of becoming a professional Ballet dancer. Nonetheless, it’s hardly easy to wear them. Pointe shoes is thick, heavy and very uncomfortable to wear, actually dance! That’s why none of Ballet dancer wears pointe shoes right away they buy it. For decades, Ballet dancers figured out how to eliminate the discomfort and make them fit to their feet when dancing. Every dancers have their own techniques to polish the shoes, yet based on the 90% same methods. We bend, massage, strike, cut, wet, heat, and even burn the shoes. Therefore, we call all of those things in once, “breaking in”. Everytime we start breaking the shoes, of course we miss their beauty. If you’re going to wear pointe shoes for the first time and your teacher asks you to break them, you might be heart broken. But I would say…you have to do it. Pointe shoes is like your feet’s best friend. How much they know each other, how far they get along with. Make it best fit to your feet, practice hard, and you will shine on the stage! Ever since my childhood in the waterfall-rich mountain city of northern Thailand, called Chiang Mai, my interest in Ballet began. I remembered that I didn’t like it when I first started, but 17 years went by, I had never stopped dancing. I was not just a Ballet dancer, but a Ballet teacher. I learned from many professional dancers around the world. Therefore, I knew what students expected to get from their teacher, and I gave what they want. I continued on to mature in Thailand’s capital city, called Bangkok, where I graduated with a Bachelor’s degree (1st Honor) in Western Dance from Chulalongkorn University. It was my biggest pride which has never disappeared. Now I’m a retired Ballet Dancer because of my right knee problem. I felt on the floor when I was doing pirouette. It happened since I was 17 years old; however, it never ruined my happiness with Ballet. Unfortunately, my body didn’t go along with my heart. I had to be patient with the chronic pain for almost 6 years. After I got the Bachelor’s degree. I decided to quit.